A Wrinkle In Time is hitting theaters on March 9th, 2018. Fans of the book have been anxiously awaiting this movie for a while! 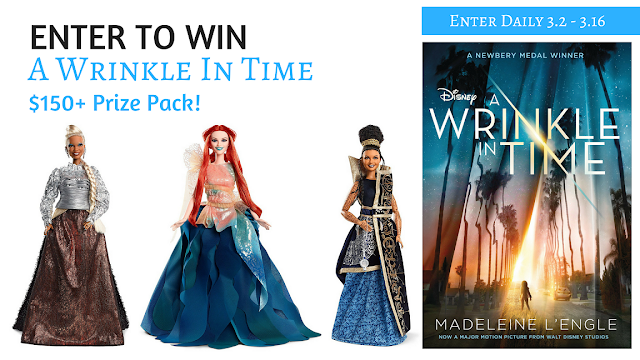 To help celebrate this release, Nanny to Mommy and The Hopping Bloggers have come together to bring our readers A Wrinkle In Time prize pack worth over $150 that everyone will want to win! Meg Murry and her little brother, Charles Wallace, have been without their scientist father, Mr. Murry, for five years, ever since he discovered a new planet and used the concept known as a tesseract to travel there. Joined by Meg's classmate Calvin O'Keefe and guided by the three mysterious astral travelers known as Mrs. Whatsit, Mrs. Who and Mrs. Which, the children brave a dangerous journey to a planet that possesses all of the evil in the universe. If you're a blogger looking to connect with brands: Join The Hopping Bloggers database and get started today! If you're a brand looking to work with a network of professional bloggers: Check out the creative campaigns The Hopping Bloggers has to offer! Nanny to Mommy is not responsible for prize fulfillment. I am most excited by the A Wrinkle In Time 5 Book Set. My daughter would love to read these either alone or as a read along with me. I know three little girls that would love those beautiful dolls. I was in awe when I watched the trailer. I had no idea they were coming up with this movie? I am glad I watched! I'm most excited for the book set. It's been awhile since I've read the story. I would like the The Wrinkle in Time Quintet Boxed Set. I also like the Wrinkle in Time soundtrack. I'm most excited about the book set!! I think my oldest would really enjoy reading this! I would love to read A Wrinkle in Time from the five book set. I’m thrilled about the book box set. That’s some good reading! I'm excited about the book set. I am most excited about the 3 barbie dolls. We would love the A Wrinkle In Time Soundtrack too! I love to read the book set! Thank you! I like the Mrs. Which Barbie too a lot! I am crazy excited about adding the movie to my Disney collection! The five book box set - A Wrinkle in Time. Im most excited about the barbies! My niece will really like the Barbies. I am most excited about the dolls! I love Barbie and would like to start a new collection! I’m excited about the book set. My granddaughters are excited about the 3 dolls that I would love to give to them!